Shortly after my unit arrived in Kuwait before Operation Iraqi Freedom, a lot of us came down with the “Kuwaiti Crud”: chills, aches, etc. I thought it was from the smallpox vaccine we‟d just received, but some were sick before they got their shot. Others got it weeks later. Eventually our whole tent was incapacitated. Spiritual crud can be contagious, too. Our choice of friends, for example, can either be a booster shot to our souls or a giant step toward heart disease. We must be kind to everyone but choose our close friends carefully. In 2 Corinthians 6:14-17, Paul compares close relationships to a “yoke‟. If you’re not familiar with the term, a yoke is a device that farmers use to bind two oxen or mules together so they pull in the same direction. There’s a great spiritual lesson about purity in this picture – if we will listen. As I see it, there are at least three types of relationships: leading, following, and collaborating relationships. And each one must be concerned about purity, whether we’re looking for someone to lead us, support us, or work with us. As God’s people, we should actively seek all three but only as would please our Lord according to His Word. For example, we need to disciple others, share our lives with fellow believers, and follow those who are farther along in their journey with Christ. But we can’t walk with a person who pulls in a different direction. If we tie ourselves to non-Christians and try to pull them to God, we might speak the truth but I doubt they will hear it as love. And if their pull is greater than our ability to resist, we may catch some of their spiritual crud. It’s not that we’re better than “dirty‟ people – none of us is clean except in Christ. It‟s a matter of spiritual health and joy. We can‟t have either if we‟re sick with the effects of sin. 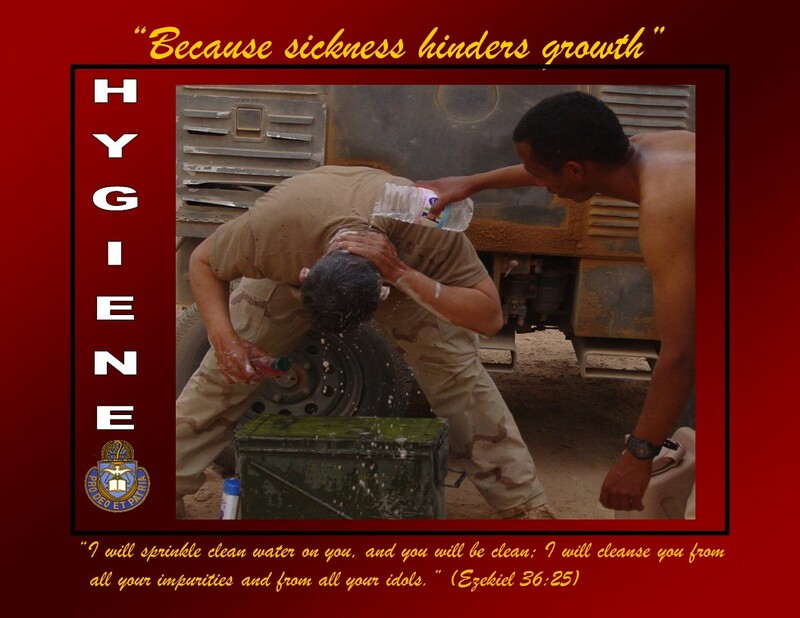 A lot of things boost our strength and joy when we’re deployed – good chow, mail from home, MWR stuff, etc, but most of us wouldn’t normally put hygiene in the top 10. Like insurance, hygiene is costly to maintain and many of us really don’t see the importance of it until we need it. It’s not that we don’t want it or need it. We expect it! Can you imagine not having fresh water to brush your teeth, wash your hands after using the latrine, or de-funk your armpits after a long day in the sun? Most Soldiers have been there, done that, and those deployed now probably still wear the stinking T-shirt! No one likes to be dirty. Filth is uncomfortable; it stinks; it invites infection; and it tends to separate us. The same spiritual problems should motivate us to seek purity within us and among us. When our souls are soiled with hate, fear, arrogance, lust, etc., we tend to want distance from others and especially from God. If you’ve been reading these articles from my book, “W.A.I.T. Training”, straight through, by now you probably understand that we also disconnect from ourselves to the point that our body and spirit do not communicate as God designed. Our “feel‟ings get confused or we just numb out because the pain is too great. You may remember Shakespeare’s scene in which Macbeth frantically tries to wash the blood from his hands to cleanse himself of murder’s guilt. But he couldn’t. Water can’t wash the soul, and today’s good deeds can‟t remove yesterday’s stains of sin. Look at Matthew 8. Jesus came to “unclean” people and reached out in the compassion and power only He can offer. He meets our heart’s need for cleansing and purity. lather up, rinse off, and get out” to conserve water. My unit had been deployed for months, and these new guys had been in country for mere days. Yet they stood in front of us in the phone line “needing‟ to talk to their spouses. And now this! I fumed in my soul, but I had to pray for myself because I, too, needed to be cleansed – of the hate I felt toward this man. And as I stood there trying to focus on Jesus, I couldn’t help but notice the smell of the shower trailer. Even with restricted water use, our drainage system couldn’t handle the runoff and the pooling dirty water stunk more each day – a powerful reminder that we can’t depend on our abilities to wash away our problems because the problem is often our own hearts. Watch God‟s creation, wonderful, warped & wounded. What is the impact of hygiene that you see in your relationships. Washing your hands, coughing up phlegm to purge your system, God’s world is full of pictures of our need for purity. Accept that, whatever you notice, you must respond to it. In Romans 2:1, Paul tells us that at whatever point we condemn others, we are guilty of the same things. Invest in Jesus. Only He can clean us up. And . . . Team with other believers who want to be clean in Christ, too.